The blend of parsley or basil, thyme, and rosemary are so common in cooking because together they just taste so well together. In this recipe, a paste is made similar to how a classic pesto recipe. The herbs are added to a food processor with Parmesan cheese, garlic, olive oil, salt and pepper. This paste is then rubbed on the roast to give it some flavor. For a nice crust, seasoned Panko breadcrumbs are used, which have been tossed with olive oil, Parmesan cheese and a minced shallot. The best part of making this dish is that it doesn't require much effort, yet it tastes as if you slaved all day. Perfect for a nice dinner or even for company, you'll appreciate how quick it is to make! Preheat your oven to 325 degrees. Line a rimmed baking sheet with aluminum foil and place a wire rack in the middle, set aside. In a large bowl, combine the panko breadcrumbs, Parmesan cheese, minced shallot, 1 tablespoon of olive oil, pinch of salt and pinch of pepper. 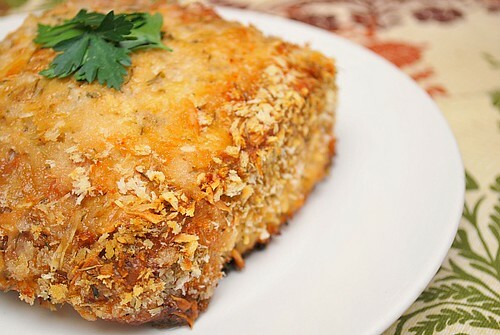 Using a fork, toss the mixture until the breadcrumbs are evenly coated with oil. In the bowl of a food processor, combine the parsley (or basil), thyme, rosemary, garlic, remaining Parmesan cheese, garlic, 3 tablespoons olive oil and a pinch of salt and pinch of pepper. Process until smooth, about 10-12 1-second pulses. Rob the outside of the roast with this herb paste and coat with the breadcrumb mixture. Place the roast in the prepared wire rack and baking sheet. Bake in the preheated oven for 50-75 minutes or until the thickest part of the roast registers 145 degrees on an instant read thermometer. Allow the roast to rest for 10 minutes before cutting and serving. 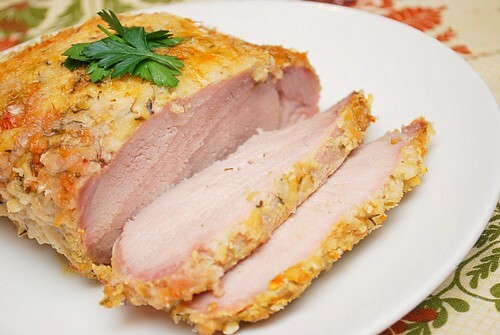 I love the idea of panko on this roast. Thanks for sharing. We will be trying this for an upcoming Sunday family dinner. I'm always looking for new ways to cook pork. You can never go wrong with Cooks Illustrated. This sounds delicious!